When I learned that I was going to Ethiopia in a couple of weeks, I asked Canadian Humanitarian’s Ethiopian coordinator, who operates the Love and Hope Centre, if there was anything I should bring. “10 books of the same title, for our reading club,” he replied. 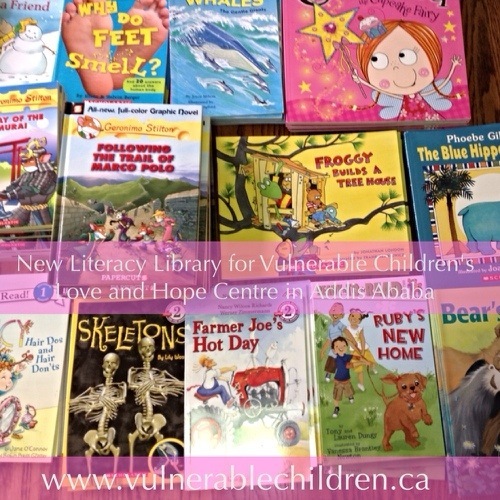 Vulnerable Children’s Love and Hope Centre provides after school tutoring, as well as hot meals, medical care and a safe place for 70 kids to play each day. 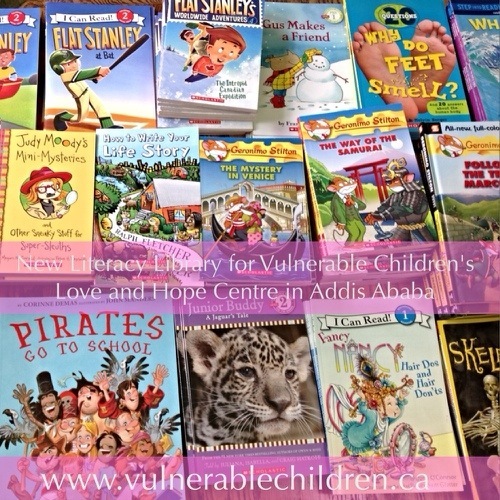 Well, thanks to the generous contributions from a variety of donors, we are bringing a whole Literacy Library to Ethiopia next week! There are 10 books of every title, for the 10 students in each reading group. We were able to purchase readers and books at 1/2 price from Scholastic (thank you!) which made the donations go that much further. There are books at a variety of primary levels, all in English, with culturally appropriate topics. We have also purchase vinyl covers for all the books, and a library stamp, to keep them in good order and organized. If you are wondering why we would bring English books to Ethiopia, it’s because English is one of the keys to getting a good education. Primary schooling is taught in each region’s indigenous language, but by the time students reach post secondary, the majority of instruction is in English. The foreign language is also a big asset is several industries, including tourism and sciences. So enriching the students’ English second language studies is contributing positively. Thanks so much to everyone who contributed to our project! We look forward to expanding the library as the students learning needs grow! If you would like to make a contribution to this project, click the red box below.